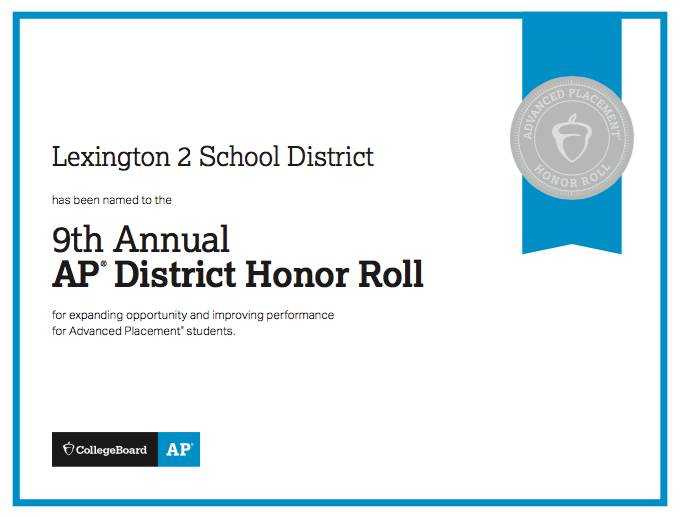 WEST COLUMBIA, SC -- Lexington Two is one of 373 school districts in the United States and Canada being honored by the College Board with placement on the 9th Annual AP District Honor Roll. Districts included on the 9th Annual Honor Roll had to, since 2016, increase the number of students participating in AP while also increasing or maintaining the percentage of students earning AP Exam scores of 3 or higher. Reaching these goals shows districts successfully identifying motivated, academically prepared students who are ready for AP. Improve or maintain performance levels when comparing the 2018 percentage of students scoring a 3 or higher to the 2016 percentage, unless the district already has attained a performance level at which more than 70% of its AP students earn a 3 or higher.